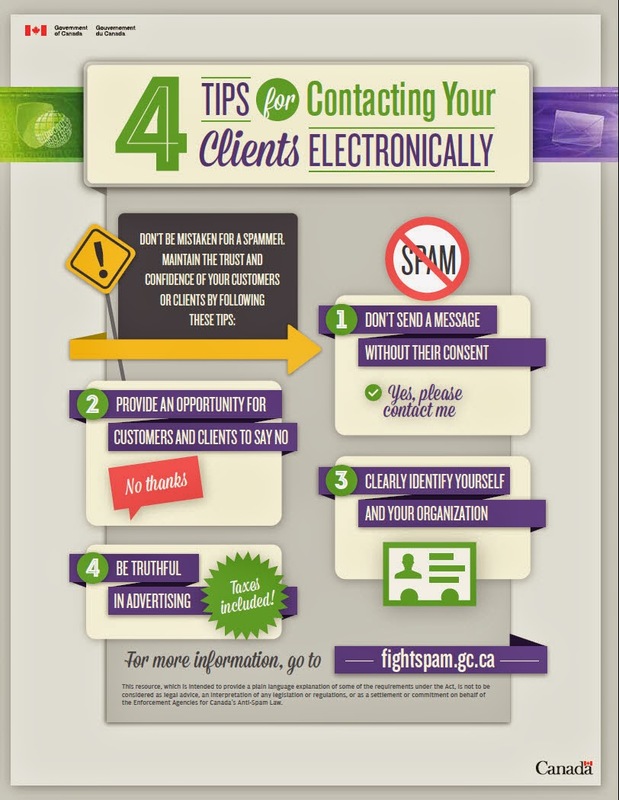 If you own a business and are using email, text messaging or social networks to promote products and services, you should know a bit about Canada's new anti-spam law (CASL), which comes into effect on July 1, 2014. The regulations, impact summary, bulletins and other resources are detailed and lengthy. I've been asked about this a lot over the past few weeks so I'm starting here with the very basics. First, determine if your electronic message is commercial in nature. The law applies to commercial electronic messages (CEMs) only. A CEM is defined as encouraging participation in a business transaction or activity, regardless of whether there is an expectation of profit. Many messages sent in the process of doing business would be considered CEMs. Get the consent of your recipients. The legislation requires obtaining "express" or "implied" consent. Express consent means that a person has clearly agreed to receive a CEM before it is sent. Consent may also be implied in certain situations, for instance if there is an existing relationship. Identify yourself in the message. Provide contact information, including your business name, postal address, and either a telephone number or email address. Include a mechanism that allows the recipient to unsubscribe from receiving additional messages. This must be at no cost to the recipient. Ensure that no part of the CEM is false or misleading, including your identity, subject line, web links, and text. B2B organizations should take note that there is an exemption for persons sending CEMs to persons at another organization, where the CEMs concern the activities of that other organization. In this case, the requirements above do not apply.